Anyone who ever had to sort out their not-so-tech-savvy mom’s “computer problems” would be able to relate to this hilarious comic by Carolyn Hiler of A Zillion Dollar Comics. Showing a customized keyboard of a tech-challenged mother, the comic humorously explains why moms have such a hard time with computers. 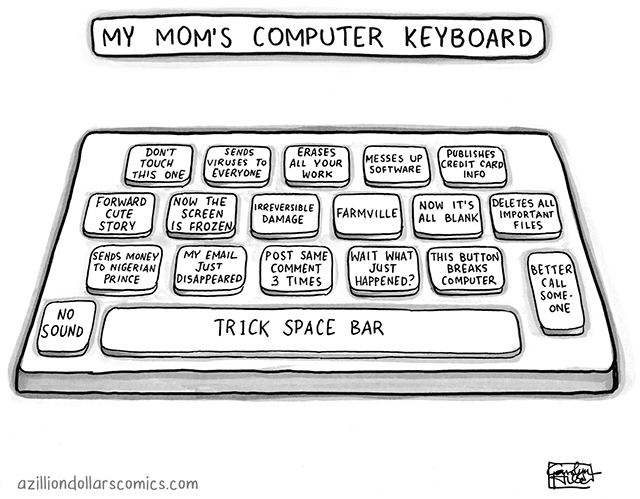 The keyboard features imaginary keys marked with common issues and questions that mothers have with computers, such as “Now the screen is frozen”. There are also keys that allow them to go straight to their “favorite” online activities, like “posting the same comment three times”.